Little Cherry Virus 2 produces cherries of small size and poor color and flavor. Photo credit: Andrea Bixby Brosi, WSU. Little Cherry Disease is a critical concern to sweet cherry producers. Diseased trees produce cherries of small size and poor color and flavor making the fruit unmarketable. Unlike other diseases that can be managed by removing infected limbs, the entire infected tree must be removed. What is Little Cherry Disease? Little cherry disease is caused by one or more of three pathogens and all are known to occur in Washington State: Little cherry virus 1 (LChV1), Little cherry virus 2 (LChV2), or Western X phytoplasma (WX). Disease symptoms include small size, poor color and bitter tasting cherries, while foliage is not affected. Where does Little Cherry Disease Come from? Little Cherry Disease is a common problem in ornamental cherries. Since the disease does not cause dieback in the tree and no one is concerned about the quality of the fruit on an ornamental variety, Little Cherry Disease generally goes undiagnosed in ornamental trees which then serve as a source for disease. Pollinator varieties can also be a source from which the disease spreads. When did Little Cherry Disease become a Problem? Little Cherry Disease is not a new problem. In 1938 it was found in the Kootenay Valley of Canada where by 1943 it had infected 30,000 trees. By 1979 the disease had caused so much damage that the last packing line in the Kootenay Valley closed down. In Washington, Little Cherry Disease became a statewide problem in 2010 and has since resulted in unpicked limbs/trees, tree removal, and even orchard removal. 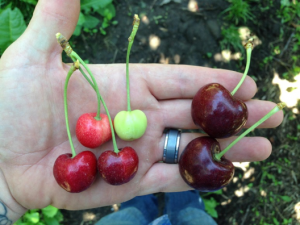 While the exact amount of infected acreage in Washington is unknown, Little Cherry Disease has been verified in commercial sweet cherry orchards in Grant, Chelan, Douglas, Yakima, Benton, and Okanogan counties. How does Little Cherry Disease Spread? Little Cherry Virus 2 is spread from tree to tree by the apple mealy bug (Phenacoccus aceris (Signoret)) and the grape mealy bug (Pseudococcus maritimus (Ehrhorn)). Both mealybug species can be found in sweet cherry orchards in Washington and their presence has been verified in LChV2 infected orchards. During 2014 and 2015, researchers surveyed mealybugs in LChV2-infected orchards to determine if their presence is an indicator for the disease, however, only half of the orchards had active mealybug populations. Mealybug presence can be a red flag, but it doesn’t mean an infected orchard has to have an active mealybug population. Western X phytoplasma is primarily spread by leafhopper (several species). Studies are underway to identify the specific leafhopper species present in WA sweet cherry orchards. Both LChV2 and WX are also readily transmitted by all types of grafting. LChV1 can also be spread by grafting; other means of spread are not known. Don’t mistake little cherry disease with small cherries. 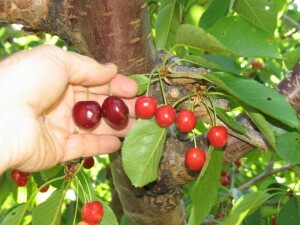 Winter damage, cold damage, inadequate tree nutrition and other factors can cause small cherries. 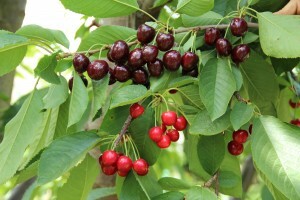 Generally, when abiotic factors cause small cherries the plants will have additional symptoms such as small leaf size or gumming. Bing Cherry with Little Cherry Virus 2. Photo credit: Andrea Bixby Brosi, WSU. Little cherry disease is unique in that the symptoms are limited to the cherries and nothing else. The rest of the tree looks fine. A diseased tree will appear normal until about 2-3 weeks before harvest, when disease symptoms become evident in the fruit. Pickers will reject the small, poorly colored fruit, leaving unpicked limbs and whole trees. Diseased fruit tastes bitter due to low sugar content. Unfortunately, visual symptoms can be confusing. Before you make the decision to tear out a block of trees it is recommended that you take a sample and send it out for molecular (PCR) testing. A revised version of a diagnostic kit, to detect only LChV2, was made commercially available by Agdia, Inc. in the fall of 2015. The kits were modified to more accurately detect a unique genetic variant of LChV2, which the original test missed. It is important to use these test kits in a clean area (not the truck tailgate as originally envisioned). Trees showing signs of Little Cherry Disease should be flagged when symptoms become evident. The best time to see obvious Little Cherry Disease symptoms is a few days prior to harvest, although they may appear several weeks before harvest. Flag limbs that are most symptomatic. All samples should be collected and placed in a Ziploc bag and kept in a cooler or refrigerator until you can send them to a lab. If mailing or couriering plant samples, please place a cooler pack in with the samples to keep them in good condition. You will need to include this form (available from their website). The contact for the ELISA lab is Tina Vasile (509) 786-9382. Drop the samples off at Prosser or send them overnight mail in a Styrofoam shipping container with an icepack. Be sure to include your name and contact information with the package. Avoid sending samples on Thursday or Friday. Check with the lab for details on current fees. Little Cherry Virus 2 on Bing. Photo credit: Dr. Andrea Bixby Brosi, WSU. Once Little Cherry Disease is confirmed in an orchard, (via sampling and testing) all trees showing visual symptoms should be removed. Scouting and removal of symptomatic trees in sections of orchard where trees were previously removed due to Little Cherry Disease infection, is a good way to stay ahead of the disease. In some cases it makes sense to remove a whole orchard block when many trees show symptoms. Little cherry virus 2 can be spread by the apple and grape mealybug. Because mealybugs don’t cause direct damage to the fruit, mealybug presence was previously not a concern to cherry growers. However, knowing that they can vector LChV2 from tree to tree, control is critical. In order to best target control measures, start by identifying your mealybug population. The two mealybug species differ in appearance as well as lifecycle. Apple mealybug are yellow/green in appearance and egg masses are cigar shaped, while grape mealybug is pink/purple with two tails and egg masses are masses of fluff. Apple mealybug has one generation per year with females emerging from overwintering sites in mid-spring, egg masses are laid around June, and crawlers emerged over the course of an entire month. This long/gradual emergence makes the crawler stage difficult to control with foliar sprays. Grape mealybug has at least 2 generations per year and at some point in the summer; eggs, crawlers, and adults are all present on the same tree, which makes control challenging. Egg masses of both species can be seen on bark, typically near the center (trunk) off the tree. Pulling back loose bark in search of egg masses is another strategy. 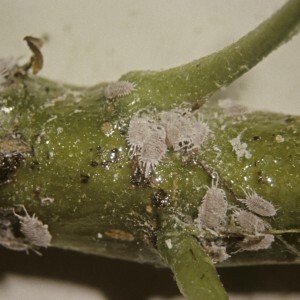 Apple mealybug adults can be seen feeding in cracks and crevices of bark during the early spring, and crawlers can be found on the undersides of leaves during June, July and August. Grape mealybug crawlers and adults are typically found feeding at the base of fruiting clusters before harvest. 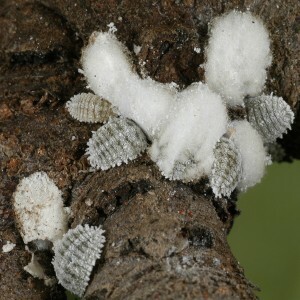 When populations are low, it is common for both species of mealybug to reside only in the tops of trees in the un-pruned suckers, making their presence difficult to detect. Beneficals including lacewings, minute pirate bugs, spiders and ladybeetles are generally quite effective in controlling mealybugs in orchards where their populations have been conserved. Conserve your natural enemy populations by choosing sprays which minimize impact on predators and parasitoids. In research orchards in 2015 Dr Bixby-Brosi collected and identified the parasitoid wasp Anagyrus schoenherri which has never before been confirmed in Washington. Large quantities of mealybug mummies suggest this parasitoid contributes significantly to biological controls. Two known parasitoids wasps of grape mealybug, Acerophagus notativentris and Pseudophycus angelicus, also contribute to biocontrol. Multiple emergence holes in grape mealybug mummies can easily be seen using a hand lens. Researchers tested several approaches to controlling the apple mealybugs: delayed dormant pesticide applications to intercept overwintering females; systemic petal fall applications to target crawlers; and foliar summer sprays timed when 70 percent of the crawlers are estimated to have emerged. In the 2014 trial, a combination of Lorsban and oil was found to be most effective at the delayed-dormant stage. Diazinon worked best at controlling the newly hatched crawlers later in the summer. They repeated the research in 2015 to the same results, with one addition: A combination of Centaur and oil also was effective at the delayed-dormant stage. Lorsban is rated as high toxicity on natural enemies. No ratings were found for Centaur. For grape mealybug, systemic compounds, Admire Pro (soil drench) and Ultor and oil, applied 14 days after petal fall showed the best results. In general delayed dormant oils were not as successful as hypothesized. In 2016 Dr Bixby-Brosi and Dr. Beers plan to trial repeated applications of horticultural oil and neem oil. Please keep in mind that efficacy ratings will be continually refined as more information becomes available.